Get all four (4) artist mugs in our brown/natural glaze in one pack for one easy price! The Ono Lono, The Kalifornia Ku, The Mondo Maori and Monster Marq. 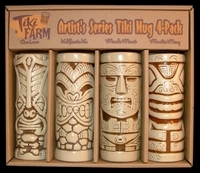 Each mug design represents a different Tiki God and/or style, so we got your Tiki bases covered for ya.